On Friday Ben, Maxwell and I attended our local Brewers Fayre which is a short drive from our home in the New Forest. On Friday it was Maxwell's Birthday however we were there for another reason - to try out their Festive menu. Ben, Maxwell and I are food lovers. 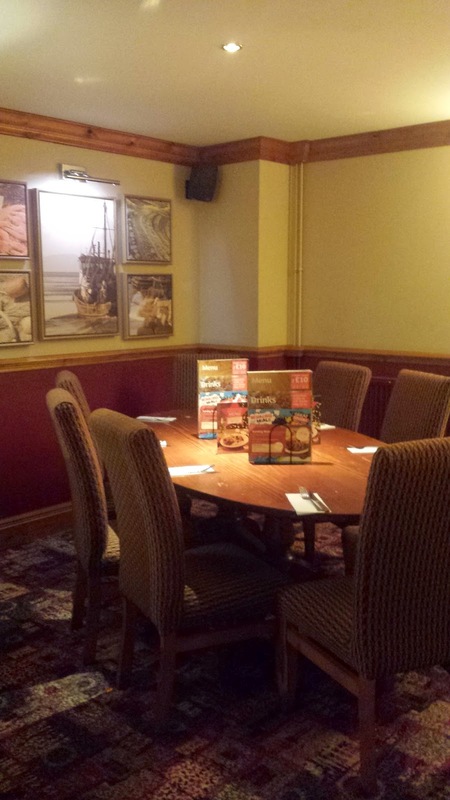 We regularly love to go out together and eat out so we were excited to go to Brewers Fayre. We have never visited Brewers Fayre before so we were a little anxious about how busy the venue - Three Bells would be due to the fact it was so close to Christmas however we had not needed to be. When we arrived at the venue, we found there was plenty of parking. The venue was easy to access and find. We parked up with ease and walked into the venue where we were greeted instantly with friendly, happy staff who instantly seated us. There were plenty of seats available in the venue even though the venue was packed with people waiting for there Friday lunches. 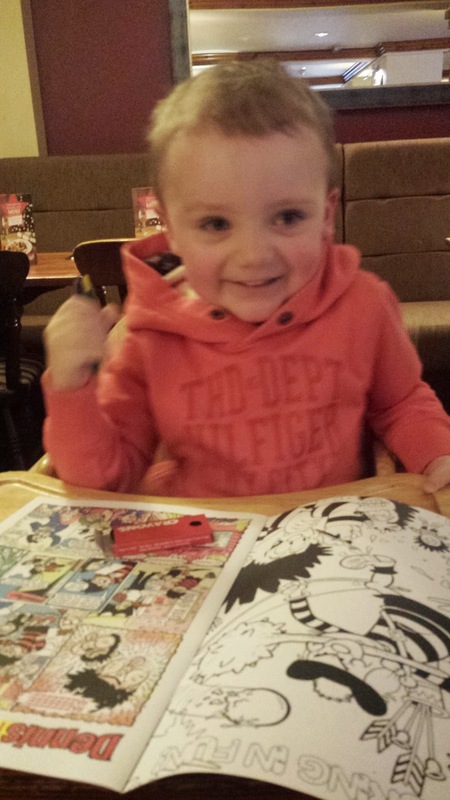 Maxwell was given a colouring sheet and a pack of colouring pens which I thought was a great idea as this kept him entertained whilst we browsed the menu and decided what we would order. Ben, Maxwell and I decided to order off the festive menu however after going to the bar to order we found that the festive menu was not available on a Friday however we were able to choose off the main menu which had a lovely range of options for us to try. Ben, Maxwell and I each decided to go for a starter, main meals and deserts.We also had a round of drinks. In total are meals and drinks came to £49. Ben and I went for the combo feast for 2 for a starter to share and Maxwell went for the vegetable sticks as well as dip. The starters arrived quickly and we were surprised at the great value of the combo feast - we found that there was a lot on the plate for us to share. In the end we all tucked into the combo feast together. 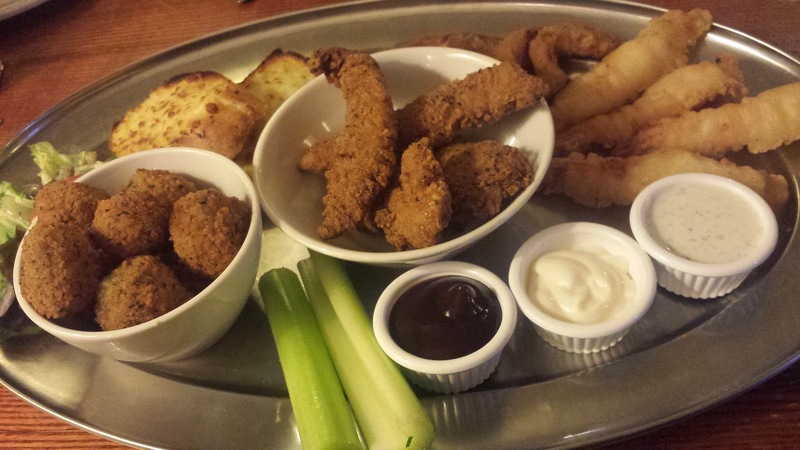 The combo consisted of battered king prawns, breaded BBQ chicken goujons, garlic and herb breaded mushrooms, battered onion rings and slices of cheesy garlic baguette. For main courses I went for the mighty stack and Ben went for the mixed grill. When the meals came out we found that they were both large and filling, Ben loved his and struggled to eat what was on his plate as there was so much there. He loved the meats which were on his plate. My Mighty Stack burger was lovely again and the burger itself was packed = one small niggle was that I found that my plate was a little empty at the restaurant. After browsing the menu once I got back home I realised that my corn on the cob was missing. 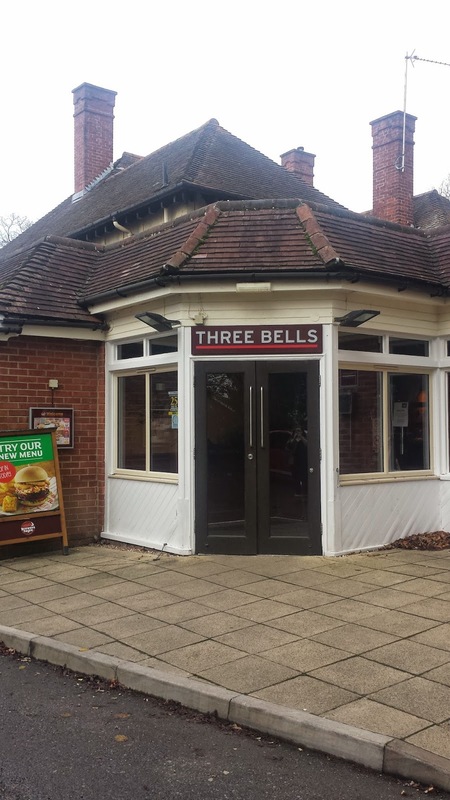 Maxwell is a little fussy when it comes to food however we found that Three Bells were very accommodating when it came to our fussy toddler. Maxwell went for the child's poppin chicken. Instead of beans they happily swapped for peas. 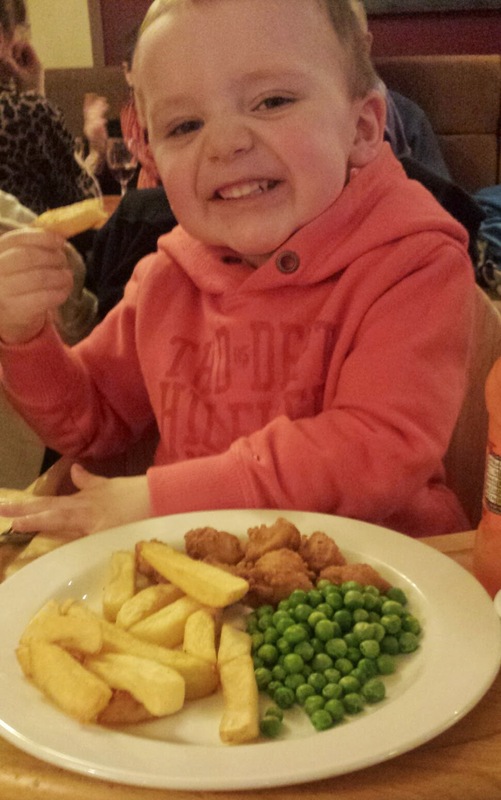 They also gave us the option to swap the chips with mash or garlic bread however Maxwell was more than happy with chips. When our deserts came out, we were massively impressed. Maxwell had mini doughnuts, Ben had a Oreo cake and I had chocolate brownies without the ice cream. Again the potions were a good size and the deserts were delicious. Overall as a family we had a cracking time. I found that £49 for a 3 course meal for a family of 3 with drinks was perfectly reasonable and we left the venue with full tummies. The food was hot, cooked well and was nicely presented on the plates. The staff were friendly and helpful and even though it was busy, they went out of there way to help. Ben, Maxwell and I would definitely return to our local Brewers Fayre again for a meal. Next time we hope to visit one which has a fab play area for Maxwell to play in. However we did receive our meal for free for the purpose of this review,.Everything written in this post is my own, honest opinion. 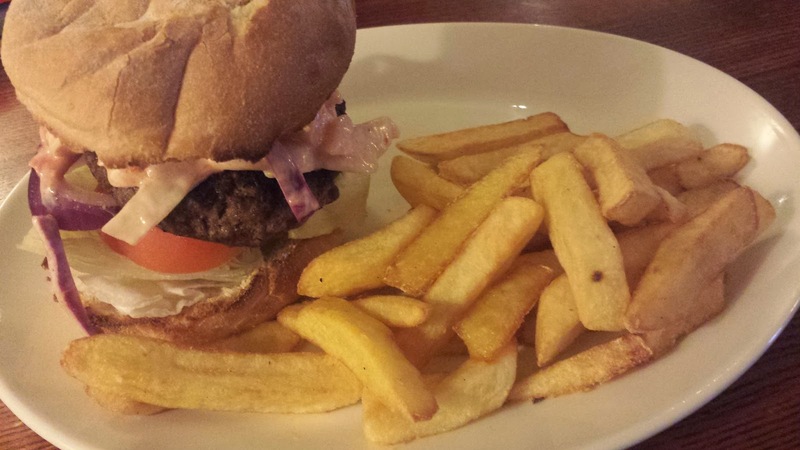 Huge burger, thanks for the review.